You Are Here: Home → Can You Be Energy Self-Sufficient With Only Solar? Can You Be Energy Self-Sufficient With Only Solar? As a prepper, it’s a pretty good bet that you are interested in being energy self-sufficient. After all, when the SHTF, there is a good chance that you won’t be in a situation in which you’ll have easy access to electricity as you do now. But we live in a society that depends on electricity. We use it for computers, to power our entertainment, to power our communication devices. We use it for heating and cooling our homes, for cooking, and, if you have a well on your property instead of using municipal water, then there is a good chance that you are using electricity to power your well for water and your water filtration system. Needless to say, we use electricity every day and all of the time. So, how do you become self-sufficient so that you can have power when your neighbors don’t have power? Well, one good option for many people is solar power. Solar panels do, in fact, work in foggy or overcast days with ambient light and will produce significant power in those times as well. As a matter of fact, solar panels can work just as well in cool weather as in hot weather. As an example: Solar panels in Sacramento, California, only produce one percent more electricity than do the exact same panels in San Francisco, California. Sacramento is known for its hot sunny days while San Francisco is known for its foggy, overcast, cooler climate. Shelley also suggests tracking your electricity usage. This will help you to plan for what size solar system which you are planning on installing and using. You’ll also want to be aware of the difference between off grid and grid-tied. Off grid means just what you think: not connected to any other source and completely self-contained. 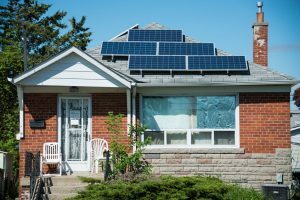 However, some areas actually require that your home is grid-tied, which means that, even if you install your own solar system, this system would sell your “excess” power back to the grid, and you will still deal with the weaknesses of the grid. You will want to find a way to work around the legal restrictions of your area to actually become self-sufficient if you live in an area that requires for you to be grid-tied. And Shelley also recommends having a backup system. Redundancy in your power supply is a smart idea to prevent you being without power if your primary power system goes down. Having taken these things into consideration, with a little planning, you can go off grid for your power needs with solar panels. Because of this, we recommend that you consider doing this so that you aren’t without power when the SHTF.